Greg and I have been living in London for 16 years now. Whenever we would go back to Greece to visit our friends and families or to go on holidays to the islands, on the way back we would fill our bags with yummy things from Greece. And no question about it this is exactly what every Greek person living abroad does, as well as any non Greek person visiting Greece! Having both worked in offices for over 10 years, just before the summer of 2011 we decided or maybe circumstances helped us decide to take a break. So we embraced the opportunity with a big smile and took off on a 2.5 month trip! We travelled a bit through Europe and ended up in Greece where we stayed for around 1.5 month, enjoying the company of our friends and families, chilling in the sun, swimming in the sea, and being close to nature. We suddenly both knew we didn’t want to come back to London and imprison ourselves back in an office. So full of energy and ideas for a new life we felt ready to stop holidaying and return back home here in London and get started! One thing led to another… and in September 2011 Isle of Olive was born! Such a great feeling, setting up our own business, working for ourselves, being outside, meeting people, being passionate about what we do! So what exactly is it that we do? We go to Greece, we find products we like, we identify the producers, we meet the producers, we bring the products here in London, and we sell them at markets or through our website. 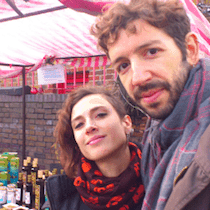 So in essence, Isle of Olive is a pop up Greek Deli shop, currently trading at markets in east and north London. We also have this beautiful website with a beautiful e-shop where we sell our products online. What does the future hold for us? We are hoping to have more producers on board, trade at more markets, and who knows? Maybe one day have our own little shop! Welcome to Isle of Olive!